Those pitch-dark early-morning runs through the streets of the Elm City — with her father Jon following by car to ensure her safety — have certainly paid off for Paris Taft. Now a sophomore on the University of Connecticut track & field squad, she returned home to New Haven over the weekend to pull a double victory at the Yale Invitational at Coxe Cage. Running an individual 400-meter dash for the first time as a Husky, her time of 55.93 was more than a second ahead of the other 51 runners. Later in the day she joined her teammates to run the 4×400-meter relay about a half-lap faster (13 seconds) than the swiftest of the other 21 teams. And while she stands alone as the only New Haven Promise Scholar competing as an NCAA Division I college athlete, she is never alone on competition day. Cheering on from the stands on Saturday were her mother, Jacky, and her younger sister Arianna, a junior trackster at Hill Career Regional High where Paris starred on and off the track. The family has ventured from Boston to New York in its support of Paris. While she was state runner-up — to national champion Precious Holmes of Hillhouse High — in the 400-meter dash in 2011, Taft’s primary events have been a bit longer — 600 meters indoor and 800 outdoor. But her 400m performance at the Yale Invitational might dictate a change of course for the Husky coaching staff. While it’s early in the season, only 18 other Division I runners have been faster than Taft and the UConn 4×4 is ranked No. 4 nationally after Saturday’s run. Paris had drawn interest from several Ivy League schools with her balanced academic and athletic performance in high school, but opted for UConn where she could be close to home and take advantage of the New Haven Promise Scholarship she earned. 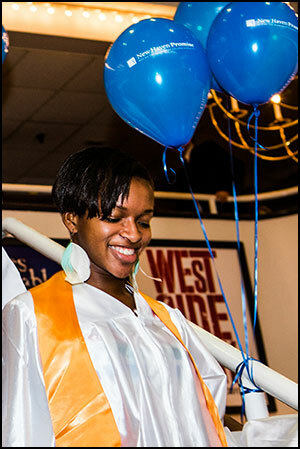 “I’m very blessed and humbled to say that I am a New Haven Scholar,” Paris said on Saturday. And her path has been inspiration to at least one young follower. Arianna — already interested in a law career — is on track to earn a full-tuition Promise scholarship in the spring of 2015. “I want to be like my sister,” she says. Certainly, Pais is a credit to her family, New Haven and the University of Connecticut!!!! All the Best Paris. You are an inspiration to your fellow school-mates. Continued Success! I am so proud of you Paris. I am always cheering you on. I can not wait to see what is next! Is a Brite young lady with a Brite future, ahead of her. Nice to see such wonderful talent coming out of our community. They failed to mention she was 5th in the Nation. I’m very proud of you babygirl keep up the good work, we all are routing for you! Congratulations on your success, keep doing your thing. Congratulations, Paris what a nice article. Keep up the excellent work!!! I am so very proud of Paris and Arianna as they are both scholars, athletes, and community servants. Job well done!!!!! Keep up the good work!!! What a wonderful article, congratulation to the entire Taft family. Way to go Paris!!!!!! Paris you should be proud of your accomplishments. You make us PROUD!